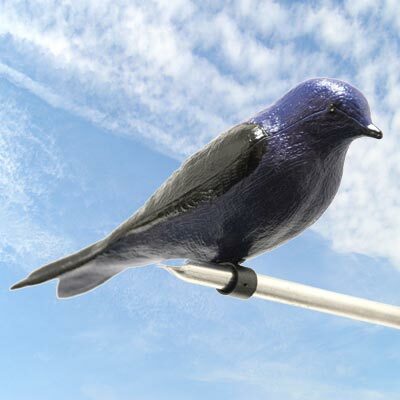 Help attract purple martins to your yard with the Heath Deluxe Purple Martin Decoy with Mount. As martins are social birds which prefer to live in colonies, establishing new housing can sometimes be difficult. Placing one or more of these decoys in and around your martin housing can help increase the chances of attracting the birds to your area. The plastic bird offers remarkable detail, such as vivid purple and black on the back and wings, texture reminiscent of individual feathers, and crossed tail feathers. An innovative clamp connects to the base of the decoy, enabling it to be placed on a perch, guardrail, or entering or exiting a gourd or home. Be sure to move the decoy every few days for more realism. Each decoy includes the mounting clamp, hardware, and instructions for placement on a variety of houses. Bring martins into your yard with help from this Deluxe Purple Martin Decoy with Mount.